Firstly, if you’d like more information about any of our classes, click on the following link: _Conference Booklet with prices etc. As all of you who organise events know, we have to cover our considerable costs of getting a speaker and having workshops. We were disappointed to have had so few people taking up the opportunity to take Kim’s workshops, and disappointed to have to announce that we have had to cancel Kim’s appearance at our Conference. All those involved have been informed. We are indeed sad that there wasn’t better uptake. The good news for those of you who are, like us, disappointed is that Kim does offer weekend classes in Ireland, click here for more information. Alternatively she offers online classes too, click here for a link to her online classes. Kim Thittichai lives on the West Coast of County Clare and gave a lovely interview published on the Textile Artist website. Discover how Kim’s process has, and is evolving. Her original training was in Wood, Metal, Ceramics and Plastics, through which she was taught how to use each material, prior to embarking on the design element. This is the bedrock of her career as an artist. Her work is split roughly into three areas – 3D & experimental textiles, wall pieces and photography. Kim travels internationally to lecture about her work and deliver various workshops and summer schools. She is renown for breaking boundaries and helping students to think outside of the box! Here’s the latest video, made in Jaipur, India. “Be inspired. Take a journey, imaginary or otherwise with Kim Thittichai on her two day workshop with the QGI. Learn how to create your own designs and printing blocks. Working though several formulas for creating original designs, discussing the use of colour and materials. Well that’s it for the #jaipurjouney 2019. This has been a wonderful experience. To be able to teach my own design exercise in such a beautiful place, has been a great privilege. To work with such a great group of girls was the icing on the cake. Harmony, laughter and of course, cheekiness from certain individuals!!! I hope you can get some idea of what fun we have had and what the group have achieved on this holiday. Thank you girls, it has been a blast. Kim has published 4 books in total, all of which are available on Amazon. This entry was posted in Uncategorized by TheQGI. Bookmark the permalink. 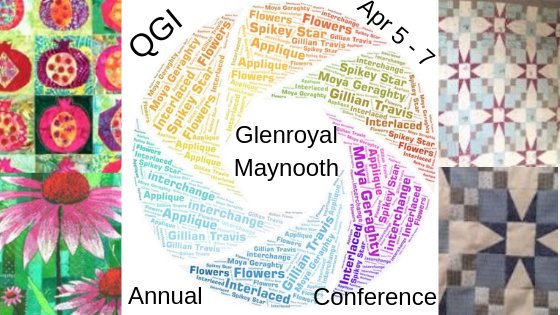 The Quilter's Guild of Ireland is committed to promote education and information about patchwork and quilting. It is a non-profit organisation.